5 MINUTE WALK TO LIONSHEAD GONDOLA! A bottle of wine at check-in. Newly installed sound reduction windows installed in early December 2013 through out the unit makes for a more quiet and enjoyable stay. 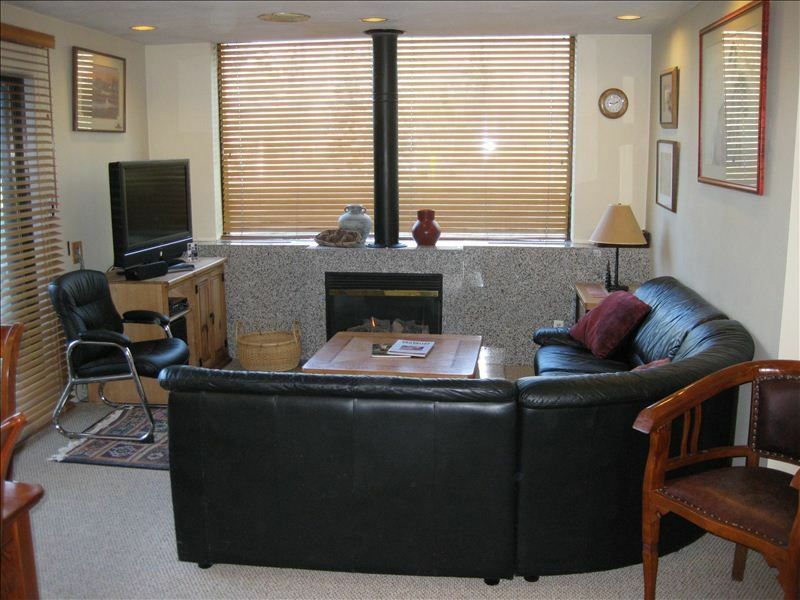 This is a bright and open two bedroom/two bath unit with lots of sunshine located in the Vail Spa Condominiums. The large master bath has a heated tile floor with a tub and separate shower. The second bedroom has a tiled walk-in shower. The kitchen also has a heated tile floor. There is free Wifi password protected in unit. Also two TVs with DVD players with over 100 DVDS. Great corner unit with view down valley. Wonderful heated year round use swimming pools and hot tubs. One indoors and one outdoors. Gas BBQ for guests use in common area by pools. On ground floor, easy access with our own locked storage for skis, no waiting for elevator. FREE village bus stops out front door every ten minutes, and goes into entire Vail valley. Also a garage with covered parking. Beds: one queen-size and stacked two double-size beds. We live in Castle Rock, Co. and love the mountains and weather here in this gorgeous state of ours. Our children are grown but enjoy coming home to the mountains as they both live out of state now with one living in Los Angeles and the other in Seattle. When we bought our unit we were looking for a place that had tennis courts and swimming pools as both our children were top tennis players in high school and love the water. The location of our condo is great... being that we could walk to the gondola and even come back to the unit for a lunch break if we chose to. Our unit is unique that is off a semi private hallway from the lobby maki g for a very quiet location. Quick easy to get to pool and spa area. No waiting for the elevator as we are on the main floor. Also easy exit to outsidefrom hallway especially nicefor summer. Also such a warm bright unit. Master bathroom has walk in tiled shower, tub and heated tile floor. Second 1/2 bath has tiled walk in shower. Our condo is located at Vail Mt. This is one of the top ski resorts in America. A view of some runs from patio. Electric baseboard heating plus tiled floor heating in master bathroom and kitchen. Building has large garage for indoor parking all cars. Fully equipped fitness room with exercise equipment in building. There is free wireless available with good signal in unit. Gas fireplace, wireless internet, dvd player, TV and 100++ dvds available. Main dining room table seats 6, plus kitchen bar seats 4. New flat screen TV in living and additional TV and DVD player in master bath. Tennis court right outside unit. Golf course available in town of Vail. 2 swimming pools (one indoor-one outdoor) heated all year long. Indoor and outdoor jacuzzi(s). Two great hot tubs. One inside and one outside. Everything was so convenient. We didn’t want for anything! Highly recommend! We will be back. Great stay in Lionshead Village! We loved the condo and it's convenience to the Gondola. Being able to store our skis at Charter Sports was a bonus! The condo kitchen was well equipped to make a meal or just entertain after a great day of skiing! The unit was well appointed and comfy like home. The staff was very friendly and helpful too. We would definitely consider staying again if we visit Vail next year. So glad to hear you folks enjoyed our condo and the friendly staff at the front. Do come back and stay with us next season. We would love to have you as returning guests. So glad you enjoyed your stay. We are always trying to add a little something or maintain our place to make it comfortable. Just bought a new mattress for double bed in second bedroom and buying new comforters for all the beds. Hope you are able to stay with us again. Owner, Meryl, is super responsive and helpful. Front desk was amazing and so nice. You have your own private hallway and private patio. Ski locker is just a door down. Pool is super close too. Everything right where you need it! Plus I'd argue it's less than a 5min walk from gondola (I'm a faster walker) and like a 3min walk to the ice skating rink and Blue Moose Pizza. The place was super clean and everything worked well. It was just the oven that we had some issues with (never got up to full temp) but that was fine because it still worked and got hot enough. What a great space for a family of four. The condo was very clean, quiet, and had all the amenities we needed. We would definitely stay here again. Perfect for us! Walking distance to skiing and shopping. We loved the location and the condo was clean and comfortable. Hot chocolate next to the fireplace, watching it snow, all was perfect. We did read in one of the notes that housekeeping was suppose to come each day. Well that didn't happen. We washed our towels (thanks to the washer, dryer, and detergent made available). Please note that this is not a complaint, all was good. Just let the owner know that if they were paying for daily housekeeping, it didn't happen all week while we were there. Vail Mountain is one of the most re known ski resorts in America. Most people come to Vail ski during the winter for skiing and winter sports, although the summers are becoming extremely popular as almost every weekend there are Art Festivals, framers markets, music festivals, etc. Lots of mountain biking, hiking, whitewater rafting too.